THE RIVER ROAD FIRE COMPANY IS LOOKING FOR NEW MEMBERS. TO GET MORE INFORMATION ABOUT BECOMING A MEMBER IN A FIREFIGHTING OR ADMINISTRATIVE CAPACITY PLEASE VISIT THE FIREHOUSE ON ANY WEDNESDAY NIGHT BETWEEN 7 PM AND 9 PM. BANQUET HALL AVAILABLE FOR USE. FOR MORE INFORMATION CLICK HERE AND EMAIL A TRUSTEE. 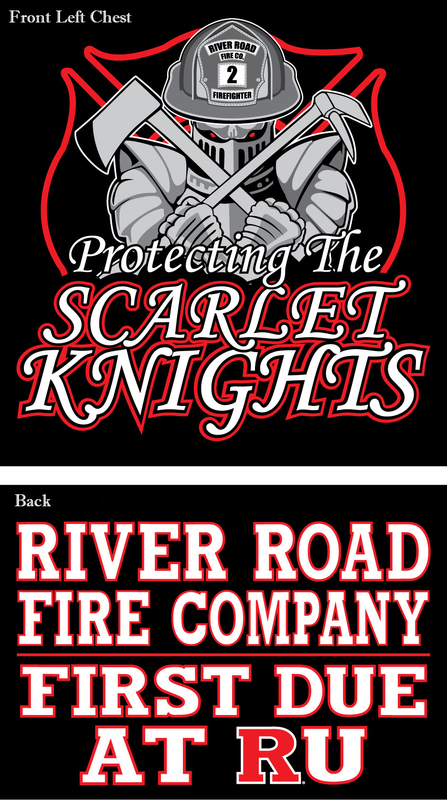 The River Road Fire Company is proud to offer an officially sanctioned Rutgers University t-shirt. The goal is to raise funds for our organization to continue providing fire firefighting and rescue serves to the residents and visitors of Fire District #2 in Piscataway, NJ, the surrounding communities, and Rutgers University as the first due fire company into the Busch and Livingston Campuses. River Road is proud to protect the Scarlet Knights during sporting events including all home football games at High Point Solutions Stadium. Each t-shirt as shown to the left is available in sizes Small thru XXXL for a $20 donation. T-shirts are available at our fire engine during home football games between the green and scarlet lots on the west side of the stadium. You can also stop by the firehouse on Wednesday's between 7pm and 9pm or send us a message to make alternate arrangements.